I visited the market place at the Civic Center in Holland, Michigan, at the tulip festival. One of the booth’s sample lavender hand lotion caught my eye. When I asked if the salesperson had any available for sale, she said no. She then handed me a business card with her Facebook Page’s address on it and said that I could order a jar. When I asked if she had a website, again the answer was no. Why does does having a website matter? A professionally designed website is your Internet vehicle for your business. It is equivalent to your business having a delivery vehicle (truck, van, car or plane). It is an proven method of delivering products and/or services to your potential and current clients. Without a website, how does your business reach your prospective and existing clients on the Internet? To Market and Advertise 24x7x365. The Internet is an indispensable means of communication for your business. A business website has become as important as providing your business card or phone number, however, a website provides 24 hour, 7 day a week, 365 days a year marketing advertising and accessibility. Because First Impressions Are Significant. The saying, you never get a second chance to make a first impression, is a significant philosophy for a business website. When potential clients investigate your company on the Internet, it is crucial to capture their attention and to visually communicate your company’s professional image. What impression would your company portray if you delivered goods in a vehicle filled with dents, exhaust fumes and full of rust? A business may choose to purchase a template that many other businesses have used or to use a website template supplied by a web hosting company to save on costs. Will a template allow your company to stand out and deliver your message from the vast sea of websites offering similar products or services? Will a template offer the ability use ethical search engine optimization to place search engines so that people can actually find it? Limited business budgets may require a smaller piece of the marketing budget for a website, however, when running a business, every dollar spent counts. The decision to invest in quality and the potential return on investment is an imperative option that every company must address. Investing in a professionally designed and search engine optimized website is a marketing expenditure that will pay dividends by catapulting your business to stand out from the crowd. To Boost Your Competitive Edge. With millions of Internet users shopping and researching products and services online, many businesses have still chosen not to have a business website. Many business websites were created years ago and need updating or replacing. Having a professionally designed and search engine optimized website will give your company or organization a competitive edge over your competition. Similar to having a business vehicle, the car, truck or van need regular maintenance like oil changes and tire rotations. A business website needs maintenance and updating as well. At some point, the vehicle needs to be completely replaced due to outdated programming that makes it functionally impaired. 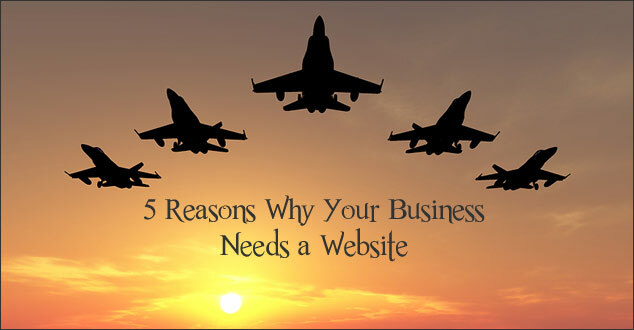 A business website can save you precious time to concentrate on running your business. It can also help your potential clients save their time as well. Providing essential information on your website such as hours of operation, directions, and frequently asked questions may reduce the number of phone calls and ultimately save time and money. A website provides you, the business owner, not only the opportunity to make money, but to save it. What do you think? Is having a Facebook business page enough? Please share your thoughts in the comments below. If you have been putting off having a professionally designed website and would like to learn more, please contact us or call 248-889-0266 to schedule a FREE Consultation. Excellent points here Robin for any business owner. Personally, my feelings, to only have a Facebook page for business is a huge detriment to the business. I appreciate you expanding on these points and always offering your knowledge. Thank you! You’re welcome! I’m glad to hear that you found this helpful. Yes, building your house on rented ground is not a good idea.